What do we do with our money? In my part of the world there’s a lottery that regularly tops $60 million. Not Powerball rich, but tax free, and I think we can all agree that’s enough for anybody. People put down a couple bucks and dream. Trouble is, most of us don’t win. We have better odds of getting struck by lightning while we’re taking a bath than we have of winning that lottery. So, what do we do with the money God has already given us? If we had only won the lottery, we’d build that church, sponsor an under-privileged student in college, or dig wells in Africa. But, we didn’t win. So, maybe we can still help build the church with what God has given. Maybe that student gets a new laptop for their college studies. Maybe a bunch of us could pool our money to dig those wells. 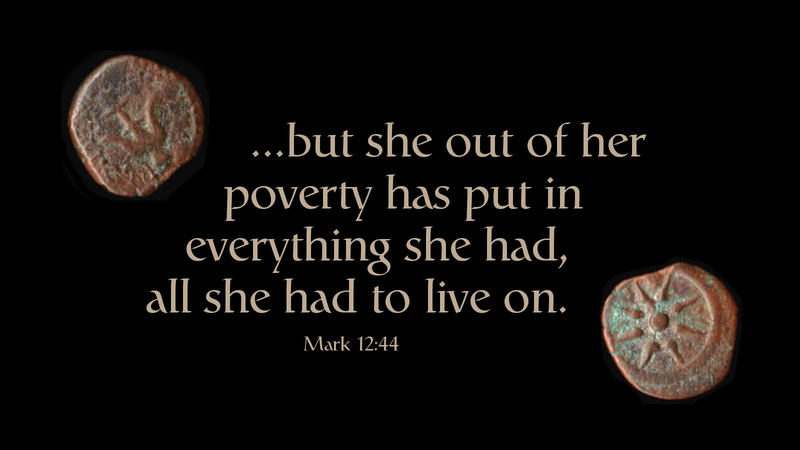 Mark records the widow and her small coins — who gave it all, trusting herself to God’s provision. The others, the ones who gave out of their abundance? Not even worthy of individual mention by Jesus. But the one? The widow? Why, we’re still talking about her. Prayer: Heavenly Father, grant us such faith-filled giving. Today’s devotion was written by Peter Lurvey, NALC Pastor, Winnipeg, Manitoba, Canada .